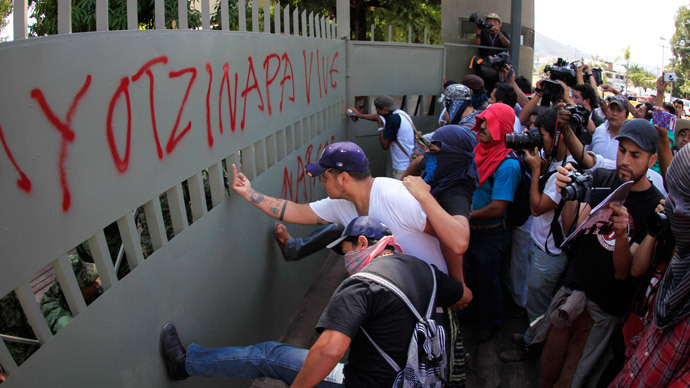 Protesters in Mexico, marking three months since the disappearance of 43 students, have turned their anger on a military base in the city of Iguala. They knocked down a door at the facility and left its walls covered in graffiti. Protesters threw petrol bombs, fireworks and stones at the facilities of the 41st Infantry Battalion of the Mexican Army on Friday, La Prensa reported. Rally participants shouted slogans against the army, accusing it of doing nothing to prevent the student abductions, which occurred near the Iguala military base in September. The rallying crowd pushed against the main gate and even managed to tear down part of it. They didn’t dare enter the facility though. Instead they covered its walls with graffiti, reading "Missing 43" and "Here are the murderers." Protesters then marched toward Iguala city hall to continue rallying there. One of the parents of the missing students has called on Mexicans to "leave their homes and join the demonstrations to demand no more missing in the country," Apro news agency reported. Simultaneously, thousands were out in the streets of Mexico City, also protesting the students’ abductions. Iguala municipal police allegedly detained the students on September 26 and handed them over to a drug gang, who killed them and burned their bodies. Several mass graves have been unearthed since then, as the search for the 43 students goes on. Federal prosecutors have still not declared the missing students dead, awaiting more DNA testing. The mayor of Iguala has been named as the possible mastermind behind the abduction. Allegedly, he and his wife asked the gang for assistance because the student protests interfered with their political campaign.